"Exploring Short Deck Hold'em": Examining a well-executed river bluff by short deck champ Jason Koon. Learn short deck hold'em strategy by looking closer at how the high rollers are approaching the game. 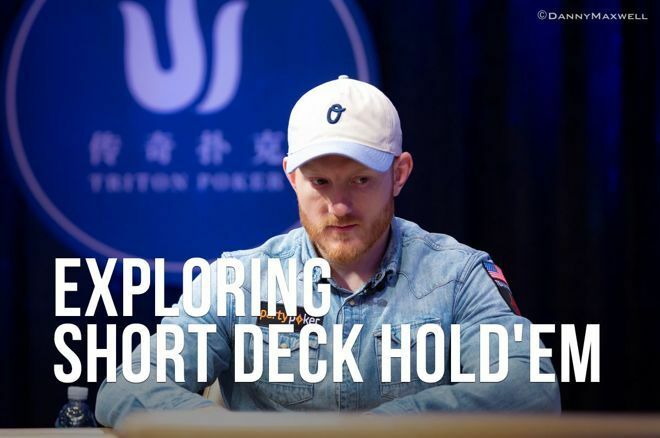 On to Part 8 of PokerNews' continued look at short deck hold'em strategy, where we're examining hands of short deck (or "six plus") hold'em played by some of the best in the world in order to see how they approach the game. Last week, we looked at a hand from a lengthy heads-up match, but this time we're taking a different tack entirely. Undoubtedly, one of the very best short deck players at the moment is Jason Koon. Koon currently sits atop the worldwide short deck tournament money rankings by a wide margin, having won a staggering $7.5 million in short deck tournaments while only one other player has (barely) cleared $3 million. In the recent Triton Super High Roller Series, Koon played a fun hand when he found himself in one of the massive multi-way pots that are a staple of short deck. The tournament in question was the HK$500K Short Deck Ante Only, which comes out to about a $64,000 buy-in. The players were gathered around a final table of nine, playing with 25,000 antes on the stone bubble for a $165,000 payout. The flop came and everyone checked. The turn was the and Koon checked. Lin, playing a stack of about 1.4 million to start the hand, bet 150,000 and action folded back to Koon. He called, bringing a river. Koon checked and Lin fired in 250,000. Koon responded by check-shoving all in for 950,000 or so more effective, and Lin quickly folded his hand. Both Haxton (in Part 3 of this series) and Jason Somerville (in Part 4) have talked about how multi-way, limped pots are the norm in short deck. Here Koon finds himself in exactly such a hand, as he actually gets the ball rolling for the limpfest with an under-the-gun limp holding . It's a hand he likely feels he can comfortably fold to a raise from out of position, but with the potential of making nut straights, it's worth one more ante when he's deep-stacked and has an experience edge on the competition. What winds up happening is four players opt to see the flop along with him for the minimum. As Somerville points out, it's very difficult to range opponents in these spots because it's hard to say whose range is strongest. Koon could have certainly limped up front with a strong holding. It's going to be hard for the middle limpers to rep much here after an ace and a king flop, as hands you'll feel very good about betting for value would likely be raising preflop — aces, kings, and ace-king. It's no real surprise that everyone checks with no strong hands and no real chance to represent anything good. On the turn, things get interesting as Koon improves to two pair and Lin to a Broadway straight. Koon sensibly checks again, as he may have the best hand but he really can't stand any heat. Lin bets about two-thirds of the pot for value, driving out the weak hands behind him, and action is back on Koon. Koon has four outs to improve, which we know from Part 2 means he's got about 13 percent probability of filling up on the river. Given that he's not even getting 3-to-1 on a call, he can only call if he thinks he will win more money or if he sometimes has the best hand. Despite being out of position, he feels confident enough that he can make good river decisions that he opts to call. On the river, Koon's hand value goes way down as an ace now beats him. He checks and Lin bets less than half of the pot. While Koon's hand value goes down here, his bluffing opportunity has skyrocketed with the board pairing. What hands is Lin likely to be betting for value? It should pretty much be boats and straights. Lin isn't likely to be limping up front with a hand that contains a seven. Boats containing a seven, therefore, are very unlikely. Koon is blocking the middle two sets of kings and tens. Most likely, Lin would have raised with aces. It seems the most likely hand for Lin to have by far is queen-jack for a straight. Furthermore, Koon likely has one of the worst hands he gets to the river with here as it's hard to see many weaker holdings with which he check-calls turn. When you're near the bottom of your range, you have more incentive to bluff. Knowing all of this, and knowing the tournament is on the bubble to boot, Koon opts to leverage his big stack to punish Lin's thin value bet. It's a beautiful spot exploited perfectly by one of the most experienced short deck players out there.